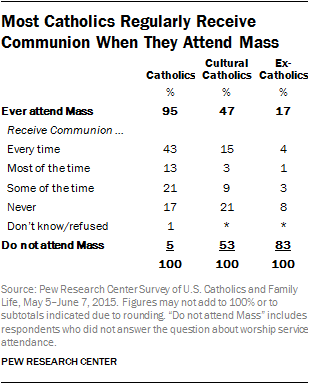 About four-in-ten U.S. Catholics say they attend Mass weekly. Few cultural Catholics (4%) say the same, but nearly half report attending Mass at least occasionally. Meanwhile, a strong majority of ex-Catholics (82%) say they never attend Mass at a Catholic church. A similar pattern is seen on some other measures of observance of Catholic rituals, such as saying it would be important to receive the anointing of the sick if they were seriously ill. Many cultural Catholics place importance on this ritual, but relatively few ex-Catholics do the same. This chapter looks at the participation of Catholics, cultural Catholics and ex-Catholics in a variety of Catholic rites and observances. It also examines differences among Catholic demographic groups on these measures and others, including style of prayer and whether a sense of familial obligation ever compels them to partake in Catholic activities. Most questions in this chapter were asked only of Catholics and those with a connection to Catholicism; for these questions, comparisons to other religious groups and the U.S. general public are not available. About half of cultural Catholics say they attend Mass at least once in a while, including 4% who say they attend weekly, 28% who attend once or twice a month or a few times a year and 15% who say they attend less often. 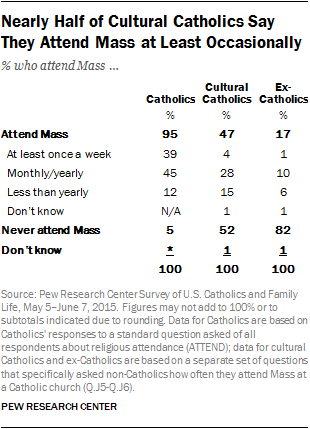 In contrast with cultural Catholics, the vast majority of ex-Catholics (82%) say they never attend Mass. Among Catholics, a somewhat larger share of women than men report attending Mass on a weekly basis (43% vs 35%). And Catholics ages 65 and older are much more likely to say they attend weekly (49%) than Catholics under the age of 30 (30%). Marital status also is associated with frequency of Mass attendance. Among married Catholics, 44% say they attend weekly or more, compared with 34% of Catholics who are not currently married. And Catholics who report that they are currently living with a partner outside of marriage or who have been divorced and remarried without having sought an annulment from the Catholic Church are less likely than other Catholics to say they attend Mass on a weekly basis (25%, compared with 41% of all other Catholics). 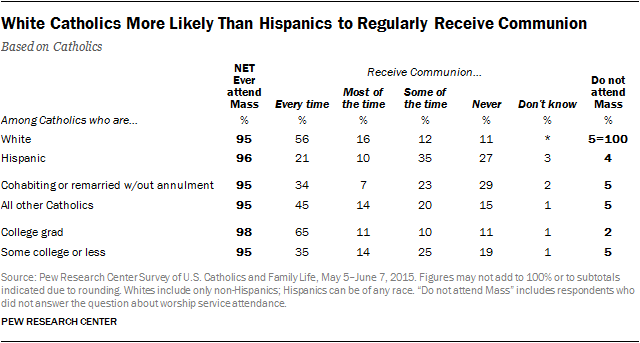 Among Catholics, regular taking of Communion is more common among whites than Hispanics. Fully 56% of white Catholics say they receive the Eucharist every time they attend Mass, and an additional 16% say they receive the sacrament most of the time. By contrast, among Hispanic Catholics (who attend weekly Mass at about the same rate as white non-Hispanic Catholics), most say they take Communion only some of the time they attend Mass (35%) or that they never receive the sacrament (27%). Two-thirds of Catholic college graduates say they receive Communion every time they attend Mass. By contrast, among Catholics with less education, only about one-third receive the Eucharist every time they are at Mass (35%). 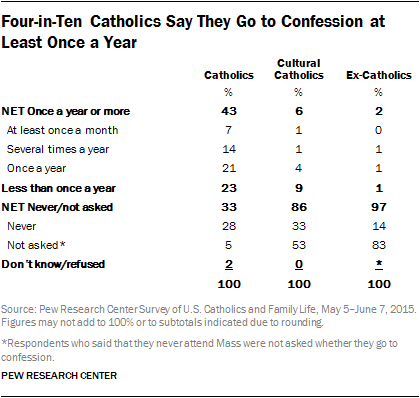 About four-in-ten Catholics (43%) say they go to confession at least once a year, including 7% who report going monthly, 14% who say they go several times a year and 21% who say they go once a year. By comparison, relatively few cultural Catholics and ex-Catholics receive the sacrament of reconciliation with any regularity. However, many cultural Catholics do observe Lent (the period from Ash Wednesday through Holy Saturday, the day before Easter). Fully one-third of cultural Catholics say they gave something up or did something extra in observance of Lent this year.10 And about four-in-ten cultural Catholics say it would be important to them to receive the sacrament of the anointing of the sick from a Catholic priest if they were seriously ill.
To be sure, those who identify as Catholics by religion are far more likely than cultural Catholics to observe Lent and to say they would want receive the sacrament of the anointing of the sick. But the differences between cultural Catholics and ex-Catholics on these questions are particularly striking. Whereas sizable numbers of cultural Catholics have retained these connections to the church, relatively few ex-Catholics have done the same. The survey shows that among Catholics, there are some differences between demographic groups on these measures of participation and observance. Catholic women are somewhat more likely than Catholic men to say they would want the anointing of the sick, while younger Catholics are less likely than their elders to say the same. More whites than Latinos say they gave something up or did something extra in observance of Lent this year. On the whole, the differences between demographic subgroups of Catholics are relatively modest on these questions. But Catholics who attend Mass regularly are, not surprisingly, far more likely than less-frequent attenders to say they go to confession at least once a year, participate in Lenten observances and would want to receive the anointing of the sick. Nearly all Catholics (97%) say they pray at least occasionally. When asked how they pray, about half of Catholics say they use mainly memorized prayers like the Hail Mary and Our Father (21%) or a combination of memorized prayers and personal conversations with God (31%). More than four-in-ten Catholics (44%) say their prayers consist mainly of personal conversations with God. By comparison, cultural Catholics and ex-Catholics rely more heavily on informal prayers. About two-thirds of cultural Catholics (65%) say their prayers consist mainly of personal conversations with God, and 62% of ex-Catholics say the same. Still, a sizable minority of cultural Catholics say they rely mainly (11%) or partly (14%) on memorized prayers when they pray. Roughly one-in-ten ex-Catholics (9%), by contrast, say they rely on memorized prayers at all; about a quarter of ex-Catholics (27%) say they never pray. The data also show that Catholics are far more likely than people from other religious traditions to use memorized prayers. About eight-in-ten Protestants (82%) say they rely mainly on personal conversations with God, while most religiously unaffiliated people either use mainly personal conversations with the deity (47%) or do not pray at all (42%). Among Catholics, more men than women rely mainly on memorized prayers, while more women than men rely on a combination of memorized prayers and personal conversations with God. Compared with older Catholics, more young Catholic adults mainly pray via personal conversations with the divine. Hispanic Catholics are more likely than white Catholics to say they mainly pray through memorized devotions, while more whites than Hispanics say they mainly pray through personal conversations with God. More than half of Catholics (56%) say they sometimes participate in Catholic activities, even if they do not personally believe in the efficacy of those activities, because it is important to their family or close friends. An even higher share of cultural Catholics (63%) say they sometimes feel they have to do this. Fewer ex-Catholics say they sometimes participate in Catholic activities out of a sense of obligation to family or friends. But even among this group, 46% say they sometimes feel obligated to do so. The survey did not specify which kinds of Catholic activities respondents may participate in out of a sense of obligation to friends or family. Such activities could include going to Mass or attending baptisms, weddings, funerals, holiday observances or other events. The survey shows that among Catholics, participating in religious activities to please family or friends is common across a variety of demographic groups. More than half of Catholic men and women say they do this, as do majorities in most age groups. About half or more of white Catholics and Hispanic Catholics say they sometimes participate in Catholic activities out of a sense of obligation to others. Even among Catholics who attend Mass most often, who are presumably among those most likely to believe in the efficacy of participating in Catholic activities, 56% say they sometimes do this out of a sense of obligation to others.